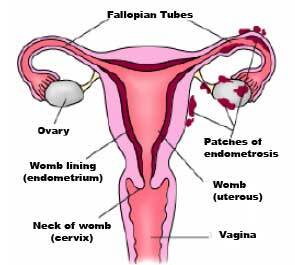 Endometriosis affects women and occurs when tissue, similar to the lining of the womb (uterus) grows in other areas of the body. This tissue grows mainly in the abdominal cavity (see diagram). The tissue is linked to the woman's hormonal cycle. However, unlike a period, the tissue remains within the body and bleeds forming adhesions (scar tissue), lesions and blood-filled cysts.